In an ideal world, business leaders are able to maintain financial growth and stability simply by driving down costs and preserving or even increasing revenue through conventional means. However, the healthcare industry—with its mix of third-party payers, for-profit and nonprofit entities, and increasing reimbursement pressures—creates unique challenges for its leaders. Survey results indicate that positive financial change is being achieved through healthcare reform efforts, although progress is moving at a slower pace than many would prefer. In the interim, traditional methods such as driving down costs through purchasing and supply chain efficiencies and maximizing revenue collection through disciplined revenue cycle practices remain effective strategies. 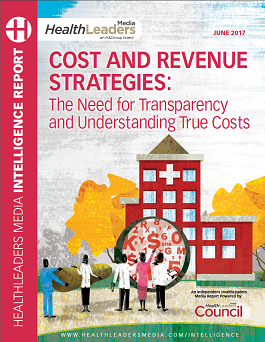 Download our FREE intelligence report to discover how healthcare executives are handling the biggest obstacle in the industry - the inability to determine the true cost of delivering care.